So June just started...and it's almost over. Months get lost, especially in Montreal. After spending the first week of this month in Montreal working the 5 day Mondial de la Biere Festival and the first ever Canadian Brewing Awards held outside of Ontario, the first two weeks seemed to pass over like a sound. A really loud, obnoxious drunken sound. But a sound non-the-less. Eitherwhich, the days they are a'gone now and it's almost Father's Day. Along with all the beer, Chef Sean is going to be on hand as well cooking up some sweet, sweet pork. A full pig roasted on a spit! What more do you need? It's gonna be sun, cars, pork and beer. I'm pretty sure Dad's around Muskoka are going to be having a pretty awesome Father's Day this year. But that's just Father's Day Eve my friends, this year, Father's Day also signifies the kick off of OCB Beer Week (http://www.ontariocraftbrewers.com/craftbeerweek/index.php#2) . Breweries, beer bars and beer fanatics across the province are hosting a multitude of events, collaboration brews and just fun times in general. 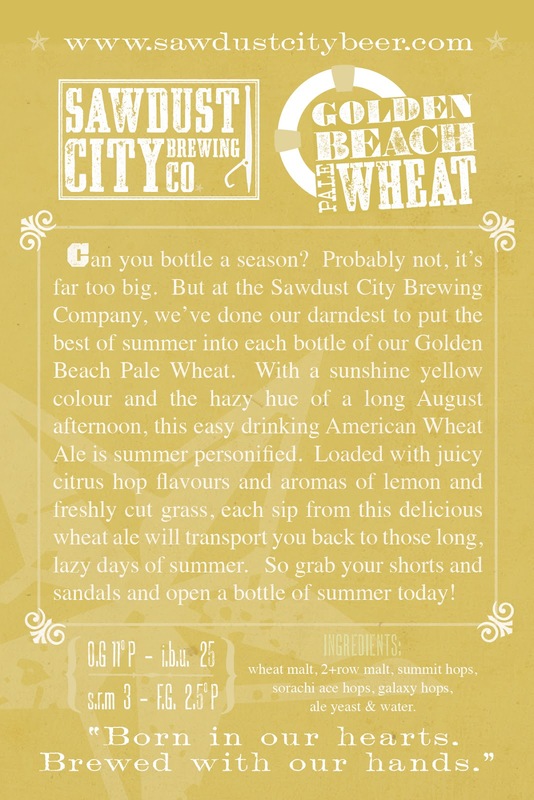 For our part, Sawdust City has a number of things going on. Firstly, we put together a special collaboration brew with our good friends at Black Oak Brewery and Cheshire Valley Brewing Co. A Belgian Table Saison, CSB is the great foil to the June heat. 4.5% abv and loaded with fruity aromas, this is certainly a session beer...and it says it in the name! CSB stands for Collaboration Session Beligian or Cheshire Sawdust Belgian, pretty clever eh? This one-off collaboration can be found at a number of events through out the week. One such event is our very own and very first tap takeover! Held at the amazing WVRST Beer and Sausage Hall in downtown Toronto (King & Portland - http://wvrst.com/), Sawdust City is going to be pouring 8 beers through out the night. Yep, you heard it right, 8 beers. 5 of our very own brands and 3 collaborations. It's going to be a night of probably too much fun. But dang it you deserve it! Also, it's not only the very first day of Summer but it's also Rob's Birthday, so there are plenty of reasons to come out and celebrate. RESPONSIBLY! That very same night, way across town at the legendary The Only Cafe (http://www.theonlycafe.com/theonly/ocbweek.html), my brother Jed and a few of his cohorts will be taking the stage as part of The Griffin House band. 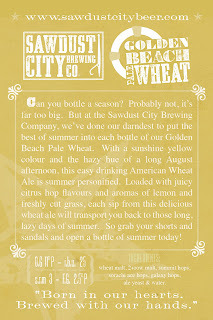 They will be representing Sawdust City in the Brewery Battle of the Bands. They are up against stiff competition though as the boys from Beau's will be in town rockin' the stage as well. So all you East Enders get out there, listen to some sweet tunes and drink some great beer. RESPONSIBLY! Next up is Corks Beer & Wine bar @ Longo's in the Maple Leaf Sqaure. Hosting a mini beer fest, the good folks at Corks will be pouring some of Ontario's most unique beers in one of Ontario's most unique bar locations, in a grocery store! Running from 5-9pm that night, you've got 4 hours to get down town and taste some great beer. RESPONSIBLY! Through out the week, Bryden's on Bloor (http://www.brydens.ca/) will be hosting "The Best of the West" event, showcasing the best beers from Toronto's west end. Sawdust will be there with a few collaborations, "How do you say Monkey in Latin?" a beer we brewed with Black Oak and our friend Frederick Trembley from MicroBrasserie de Charlevoix in Quebec. It was a unique one-off brew we put together for the CBA's this year (but I've probably already told you about that). We'll also have "Marked For Death Match", a double collaboration! Half COCKpuncher, half IndieAleHouse Wit, it's Segal and Van Damme together at last. Starting Sunday and running all week there will certainly be plenty of chances to get out to Bryden's and enjoy RESPONSIBLY! Lastly, to wrap up this amazing OCB Beer Week, we have Session 99 THE CRAFT BEER FESTIVAL. (http://sessiontoronto.ca/) Full of special one-off casks and kegs, this festival not only showcases amazing beer from local breweries, but also great local food, music and artisans. Held at 99 Sudbury, Session is into it's third year and is out to prove it self as one of Toronto's premier beer events this year. And Sawdust City is going to be there pouring not only our beer, but also a few special collaborations never done tasted before. (wink, wink nudge, nudge Amsterdam and Bellwoods) But the real big deal this year is the deal it self. In order to taste all this lovely beer, all you have to do is pay one simple admission fee. That's right, no more waiting in line for beer tickets, no more muss or fuss. One price gets you all you can drink and eat. There are two sessions, 1-4pm and 6-9pm. Pay one price, drink and eat as much as you want for 3 hours. RESPONSIBLY!